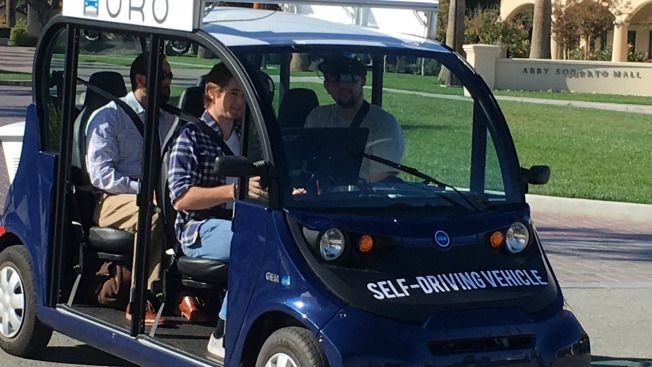 A self-driving shuttle will be available to transport students, staff, faculty and guests around Santa Clara University until Feb. 7, university officials said Monday. The university launched the pilot program in partnership with local startup Auro Robotics. "We believe this to be the first operating driverless shuttle on a university campus in the United States," university spokeswoman Tina Vossugh said in a statement. Officials said the shuttle will travel at 7 mph and is armed with sensors to avoid poles and students. The shuttle can transport three passengers at a time, and will operate in a loop, making five stops on campus. It will run from 8 a.m. to 11 a.m. and 1 p.m. to 5 p.m. Monday through Friday, and 9 a.m. to noon on Sundays.